The symptom prevalence in patients with advanced cancer depends on the type of primary cancer, and the palliative treatment varies according to the nature of the primary cancer. Palliative treatment for unresectable skin cancer has not been fully discussed. Patients with unresectable skin cancer sometimes show the primary lesion in the skin and metastases to the lung, skin, liver, and bone. Pain, anorexia, and dyspnea commonly occur in such patients, and bleeding, exudate, and offensive odor are characteristically observed. For the last three symptoms, surgery and radiation are effective therapeutic options, and cryotherapy, Mohs’ chemosurgery, electrochemotherapy, and some topical ointments and dressing materials are also additional options. For pain due to bone metastasis, pharmacotherapy with opioid and/or non-opioid agents is the most basic treatment, and radiation and bisphosphonate therapies are other options. For dyspnea, which is an intractable and uncomfortable symptom, morphine and oxygen play a leading role in treatment. Red blood cell transfusions may be effective for some patients with dyspnea induced by anemia. Nutritional supports and pharmacotherapy are therapeutic options for anorexia. As nutritional supports, enteral nutrition is better than parenteral nutrition. There is some evidence of progestins and corticosteroids having supportive effects for anorexia. 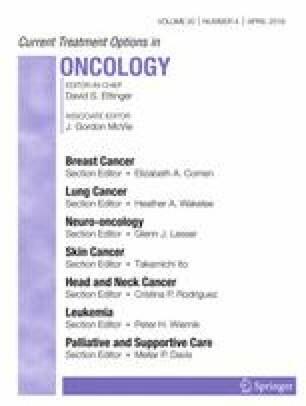 Dermatologic oncologists should be skilled with symptom managements to maintain the quality of life in patients with unresectable skin cancer and their families. Hiroyuki Goto, Yoshio Kiyohara, Masahisa Shindo, and Osamu Yamamoto declare they have no conflict of interest.